SmartTrack: Now You See It, Now You Don’t! The map from the Globe & Mail is reproduced below. According to Moore, the cost of adding SmartTrack to GO under this configuration would be much, much less than the originally quoted figure for the entire line. In turn, this would free up substantial capital spending headroom in City plans for other projects. SmartTrack service at 15 minutes (the level proposed in Tory’s campaign) is far too infrequent to attract much riding, and especially to make a dent in demand on the existing subway interchange at Bloor-Yonge. We saw this in the June 2015 Metrolinx demand projections that were far more favourable to a Relief Line operating north to Sheppard and Don Mills. However, getting SmartTrack service down to as close a headway as every 5 minutes will be challenging for Metrolinx and for the corridors through which this would operate. There are no details yet on how this would be achieved. The Eglinton West LRT has always been the superior way of serving this corridor compared to the heavy rail SmartTrack scheme. ST foundered on major problems with constructibility and neighbourhood effects, issues that were dismissed in a stunning display of cavalier “expert” knowledge during the campaign. Planning by Google Maps from an office in the UK has its limitations, but Tory’s campaign relied on this “expertise”. One shameless professor even rated ST with an “A+” in the CBC Metro Morning interview. Keeping the first phase of ST confined south of Eglinton on both branches limits the operating costs the City must bear if this to be truly a “Toronto” project with “Toronto” fares, and it avoids the complexities of building into the 905. Indeed, SmartTrack began as a real estate development scheme to make commercial property near the Airport and in Markham more accessible from downtown in a series of studies that actually claimed the market for downtown office space was static and falling. Yet another expert should be eating crow pie from his perch on the Metrolinx board. It was never clear why Toronto should shell out billions to improve property values in the 905, and this task now falls clearly to Metrolinx where it belongs. 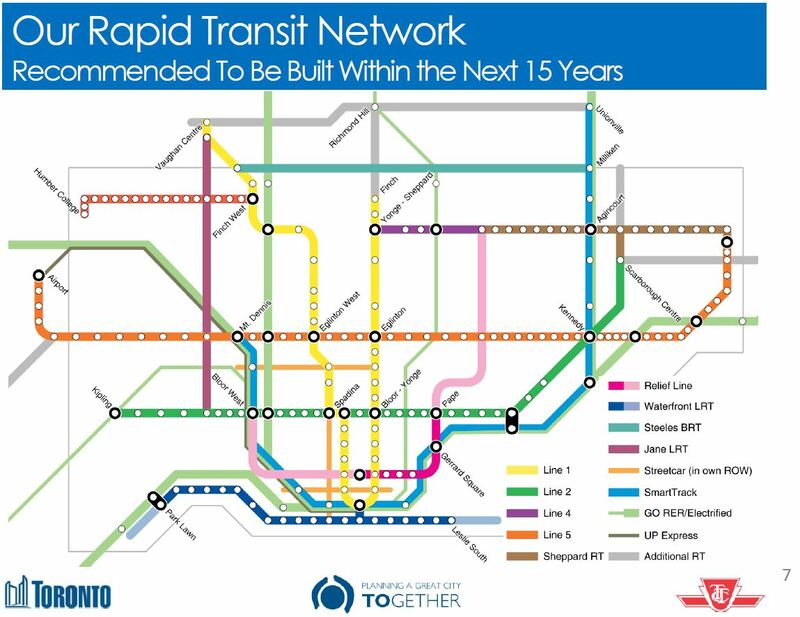 The eastern leg of SmartTrack, north from Kennedy, obviously competes with the Scarborough Subway Extension, and there is no need for two routes serving the same demand, especially when GO already plans substantially improved service in the rail corridor. The long-standing issue of SSE demand may be clarified by the absence of SmartTrack as a competing service. These changes could also foreshadow a revised schedule for the LRT projects at a time when “shovel ready” projects are in demand to soak up new federal spending. Eglinton West’s LRT extension is relatively easy to build, and it could be started soon enough to complete concurrently with the main Crosstown route. There is also the matter of the Sheppard East LRT including its proposed service linking to UofT Scarborough campus. Coming weeks may bring many sputtering denials, or possibly, much improved clarity and acceptance of an – at last – realistic plan.